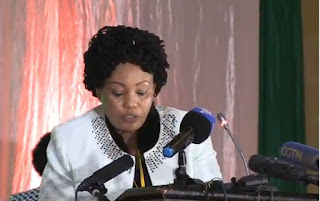 The European Union Election Observer Mission in Zimbabwe has described Zimbabwe Electoral Commission chair Justice Priscilla Chigumba as an able lawyer who “knows very much the law and sticks to the law”. Justice Chigumba has been abused by the MDC Alliance, with its leader Mr Nelson Chamisa this week blasting her, saying she did not understand the law. But observers have been indicating that the demands by Mr Chamisa on Zec were not provided for by the country’s Constitution, yet Justice Chigumba has been doing everything possible to accommodate them. Mr Brok also hailed the peaceful environment obtaining in the country ahead of the July 30 elections. He condemned the terrorist attack that targetted President Mnangagwa and the Zanu-PF leadership at White City Stadium in Bulawayo last month, that killed two people and injured over 40. Mr Brok applauded the introduction of the Biometric Voters’ Roll, saying the move was important in ensuring a transparent poll. “Political campaigns are in full swing and I was saddened to hear about the June 23 incident at the Presidential rally in Bulawayo and my thoughts are with all those affected,” he said. “There is no place for violence in an election. The creation of the brand-new biometric voters roll for the elections is welcomed. This has been a major effort by the Zec, however, I understand that a number of issues relating to the roll have been evident during the process. “I hope that Zec would be in a position to ensure that the list is as accurate and inclusive as possible for election-day, with all anomalies addressed. “We have been on the ground since June 6 and the presence of the EU election observation mission demonstrates the European Union’s commitment to the conduct of peaceful, inclusive, transparent and credible elections in Zimbabwe. Mr Brok said the July 30 harmonised elections were a critical test of Zimbabwe’s reform process. “These elections are a critical test of Zimbabwe’s reform process and we will see with a lot of hope,” he said. “Elections are an essential step in a long and challenging reform process. “I believe also that reform process might change the attitude towards Zimbabwe and we want to be hopeful that this is possible, especially also for questions like sanctions, questions like investments in this country, questions of making it possible that Zimbabwe will overcome some serious economic problems, this is partly interconnected, therefore, we hope that this reform process, including the elections will be successful. Mr Brok said they were going to issue a statement after the elections. “In line with our usual practise, we will issue our statement of findings only after the election in order to reflect on the entire process up to that point,” he said. “During my visit, I have listened to my interlocutors and heard their perspectives and concerns. As a mission we will continue to do this beyond the election day to ensure we are in a position to later offer an informed assessment. “At this stage, I do not want to start offering assessment as it would be premature for me to do so. I want to stress here that in making our assessment, we will consider the environment and context for the polls alongside the process in and around the election.